Keystone Automotive Operations has welcomed Havis, Inc., provider of in-vehicle docking and mounting solutions, to its truck and off-road category. 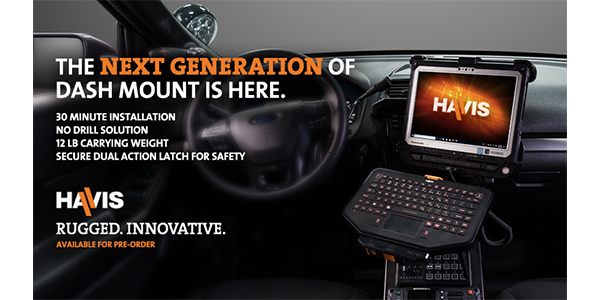 For more than 80 years, Havis has been designing and engineering high-quality products for mobile professionals across a variety of industries, including public safety, government, public works, health care, fleet transport and more. By partnering with major computer manufacturers such as Dell, Getac, and Panasonic, as well as leading vehicle OEMs like Ford, Chevy, Dodge and Nissan, Havis has created solutions that allow both technologies to operate harmoniously in mobile work environments. Products include computer docking stations, motion devices, equipment consoles, and power management devices, as well as prisoner transport systems and award-winning K9 inserts. As the mobile workforce continues to expand, so does Havis Inc., the company adds. Headquartered in Warminster, Pennsylvania, the company has another major facility in Plymouth, Michigan, and in 2017 established Havis Europe Ltd. to better support its international customers and partners.